Hailsham Ahoy! 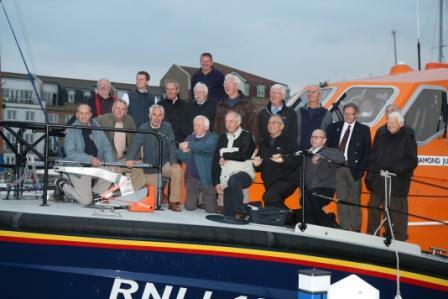 Members visit new Eastbourne Lifeboat – none overboard! She’s big, at over 16 metres, she’s bright in corporate orange and navy blue, she’s new, and her name is ‘Diamond Jubilee’. Who is she? 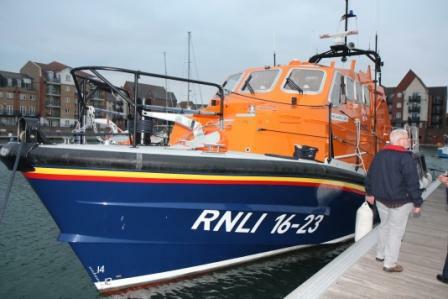 Although not the closest club to Eastbourne’s Sovereign Harbour where she is moored RC Hailsham have had a continuing relationship with the Eastbourne Lifeboat station. The coxwain visited the club in 2010 and now the club have just had a ‘return match’ and inspection visit to the new Tamar Class boat that the station received last year, actually, just in time for the Diamond Jubilee, and it was Eastbourne station that was given the honour of escorting the royal party on the water pagent down the Thames. In case you thought that Eastbourne was just too sedate a resort to have an actual lifeboat, it is always int the top five of UK and Irish launchings. Whether it is a sick crewman off one of the many ships in the channel or a holiday-maker who has got into difficulty. The new lifeboat was funded exclusively from local donations and cost a bit over 2.7 million pounds. She is state-of-the-art in all departments. The engineer can open sea valves, and other things from touch-screen switces on his console, at his seat. The coxswain, (in the RNLI they’re not ‘skippers’) too has a control screen in both his positions, in the cabin and ‘on the bridge’. The RNLI is one of only two maritime rescue services that are totally charity-funded, the Dutch being the other. And they are proud to remain that way. Hailsham club are pleased to see the result of their contributions too! Thank you for showing us round. This entry was posted in Rotary Club of Hailsham, Uncategorized. Bookmark the permalink.